With stems (con palos) – a specialist energy burst, made with Guaraná, deliciously fruity in taste. CbSé is an important Argentinian brand of yerba mate. It specialises in yerba mate with stems (con palos) blended with various herbs and flavours to tailor make each blend for a particular need or taste. Each blend is delicious in its own right – which ones have you tried? 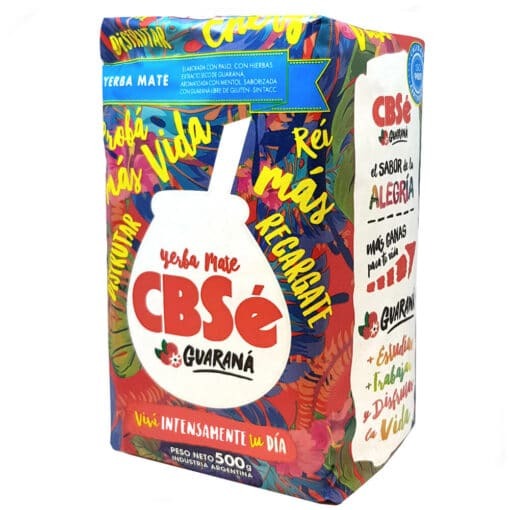 Yerba Mate Cbsé Guarana Energy harnesses the energy of yerba mate and blends it with the fruity taste and energy of the Guarana berry – one tasty kick! Guarana (paullinia cupana) is a plant native to the Amazon basin, and is especially cultivated in Brazil. It has been used for thousands of years by the amazonians as a natural remedy for well-being and stimulant for energy, stamina and strength. It therefore makes a great ingredient to pair up with yerba mate which is also a source of energy, vitamins and minerals. To read more about the Guarana berry, see our info page. The tradition of drinking yerba mate is such an important part of the South American culture. This is specifically true in Uruguay, Paraguay, Argentina and Brazil. Although in addition it is also enjoyed in other South American countries. Typically, yerba mate is drunk from a natural gourd (a hollowed out fruit) used as a cup. The infusion is then sipped through a metal straw known as a bombilla that has a filtered end. This happens while groups of friends and family get together to chat, and enjoy mate together. With any purchase of loose leaf yerba, full photo instructions will be provided on how to brew the perfect yerba mate. So there is no excuse not to brew the perfect yerba mate! If you get it right, your yerba will always taste great, and last twice as long. Most of all, practice makes perfect! Excellent. It brews lovely and has a mild taste, without bitterness. Really delicious. I've been brewing in a cafetière which works really well and is very economical. The guarana taste comes through & is very refreshing. Great taste overall & not too punchy. Small stems only so is very good. It does however loose taste quickly I find after 700ml of water. I really like this yerba. Great service,I would buy it again! my favourite Yerba Mate which I actually make in a cafeteria as I do all of them.